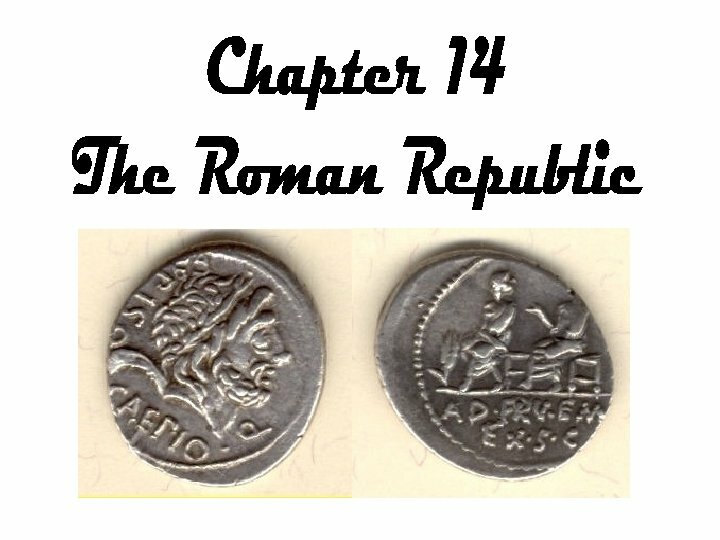 At the head of the Roman Republic were two consuls, administrators and military leaders, who were chosen each year. As each had the power to veto, or say no to, the acts of the other, both had to agree before any law was passed. Next in importance was the Senate. Three hundred senators were chosen for life to handle daily problems and advise consuls. Judges, assemblies, and tribunes, or government officials who protected the rights of plebeians, were also part of the Roman government. In 450 B. C. , Roman laws were carved on 12 bronze tablets known as the Twelve Tables and placed in the Forum. 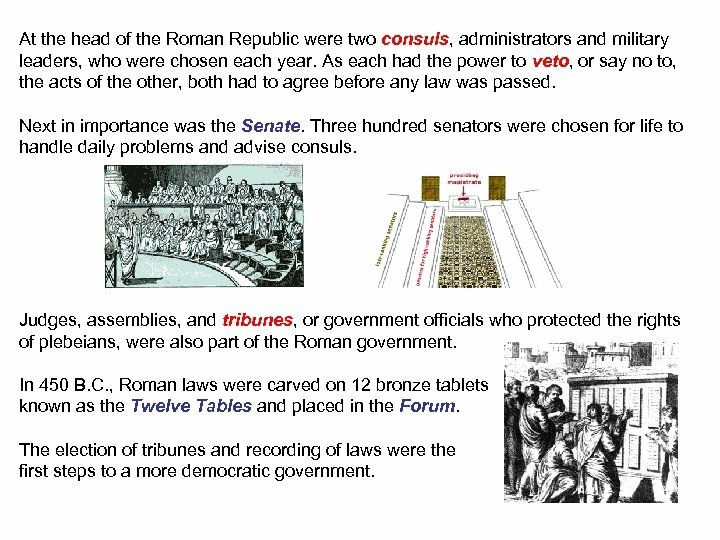 The election of tribunes and recording of laws were the first steps to a more democratic government. 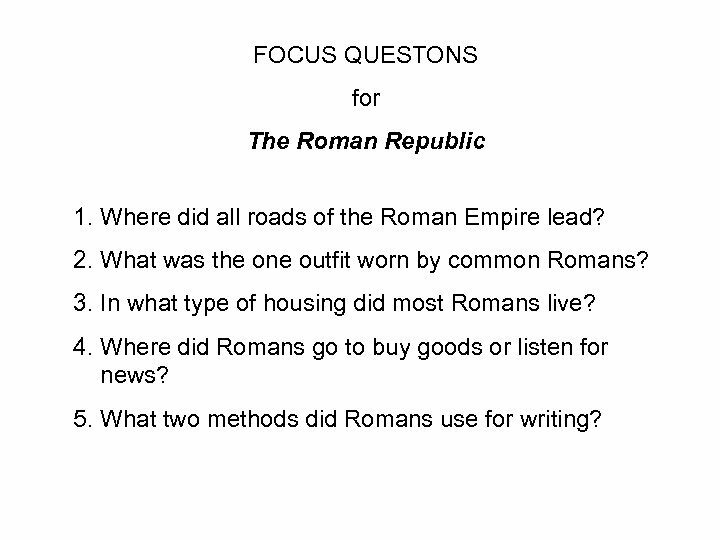 FOCUS QUESTONS for The Roman Republic 1. Where did all roads of the Roman Empire lead? 2. What was the one outfit worn by common Romans? 3. In what type of housing did most Romans live? 4. Where did Romans go to buy goods or listen for news? 5. What two methods did Romans use for writing? The Romans worked to protect their republic because they were afraid that the Etruscans would try to get back control of Rome. To protect their new boundaries, the Romans either conquered their neighbors or made alliances with them. By 146 B. C. , Rome ruled most of the Mediterranean world. 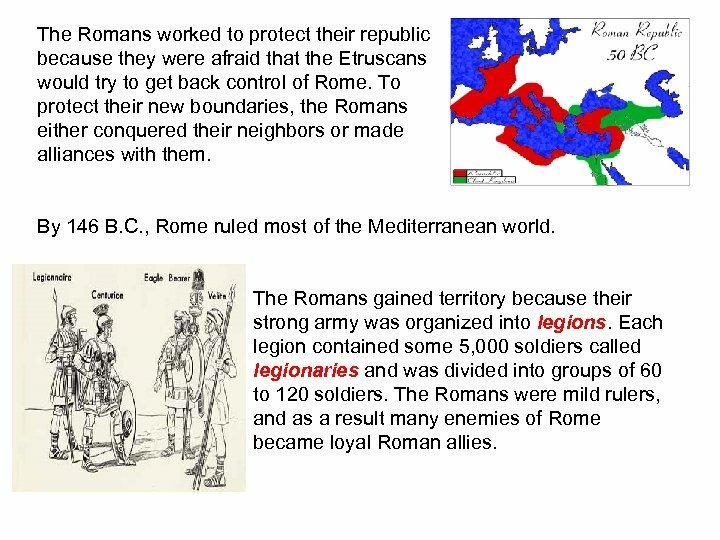 The Romans gained territory because their strong army was organized into legions. 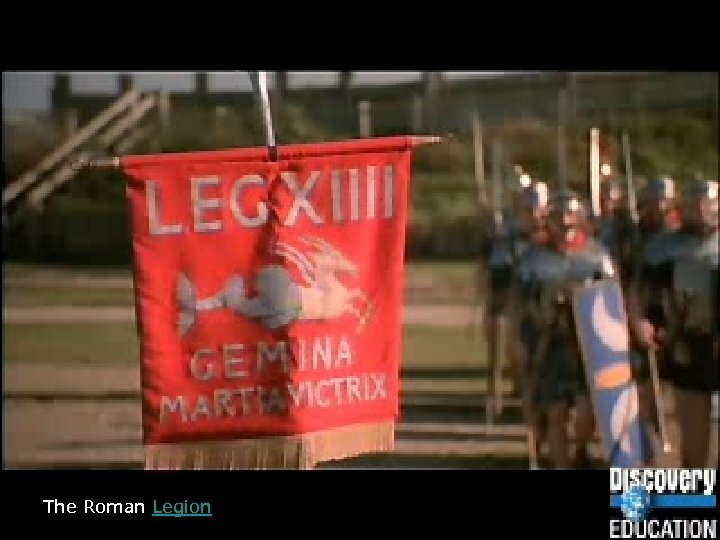 Each legion contained some 5, 000 soldiers called legionaries and was divided into groups of 60 to 120 soldiers. The Romans were mild rulers, and as a result many enemies of Rome became loyal Roman allies. Questions for Rome’s legions: 1. How long did it take Rome to expand its borders throughout the Mediterranean? 2. Why did foreigners fight for Rome? 3. Who did Romans borrow the battle helmet from after they were conquered by Rome? 4. What was the pilum? 5. Which weapon did the Romans borrow from Greeks? 6. How was a ballista used? 7. How many men in a legion? Why were they sucessful? 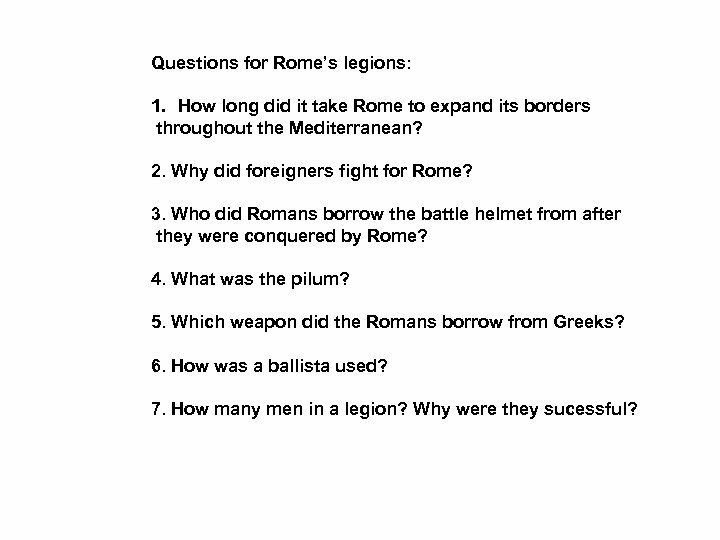 FOCUS QUESTIONS for Rome’s Military 1. Which empire first threatened Rome’s control of the Mediterranean? 2. Who served in the Roman army? 3. 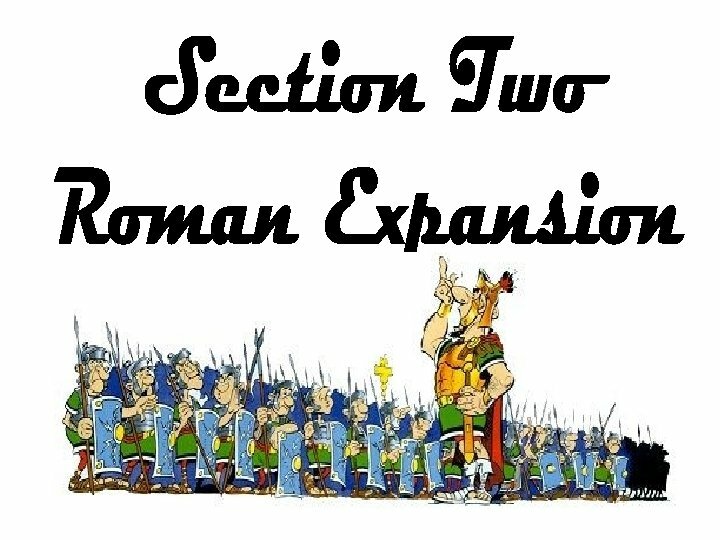 What was the primary goal of early Roman warfare? 4. 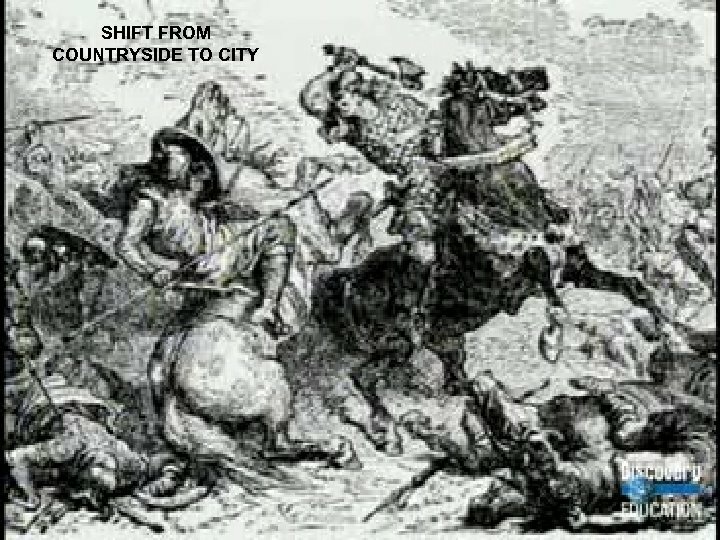 What military inventions are the Romans credited with? 5. What were 2 secrets to Rome’s military success? By 264 B. C. , the Romans had conquered some Greek city-states in southern Italy, bringing them into contact with the Phoenician city of Carthage. The Romans felt threatened by the Carthaginians, and they also wanted Sicily’s granaries. In 264 B. C. , the Romans and Carthaginians clashed in a war that lasted for 23 years. 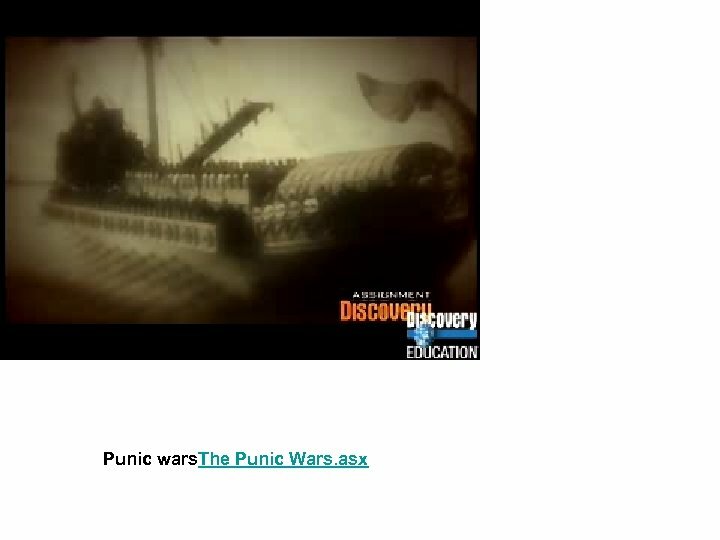 It was the first of three wars between Rome and Carthage that came to be known as the Punic Wars. Carthage’s military strength lay in its navy, while Rome’s lay in its army which defeated the Carthaginians. In 241 B. C. , the Carthaginians agreed to make peace and left Sicily. 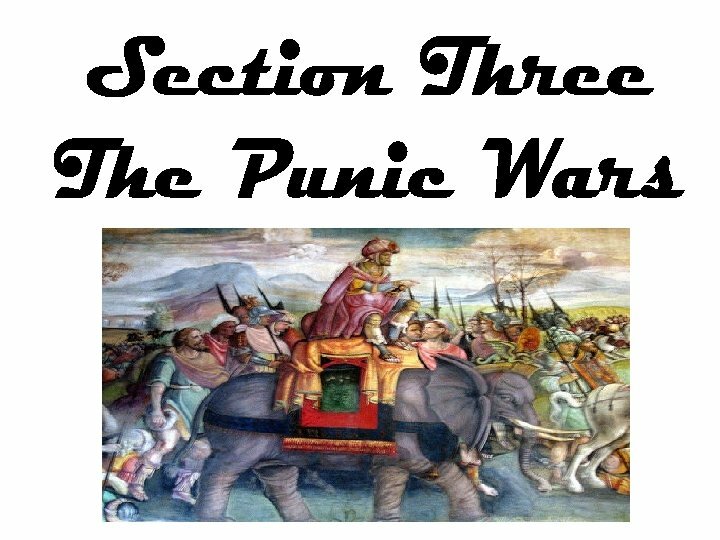 In 218 B. C. , the Second Punic War began. The Carthaginians, led by General Hannibal Barca, attacked the Roman army by land from the north. 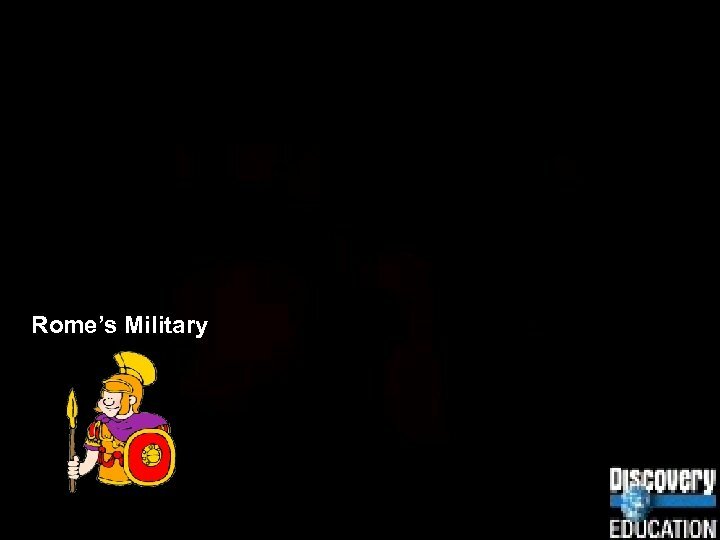 He was unable to capture Rome. Then, the Romans attacked Carthage, and Hannibal was called home to defend it and he lost his first battle. In 201 B. C. , Carthage agreed to pay Rome a huge sum of money and to give up all its territories, including Spain. 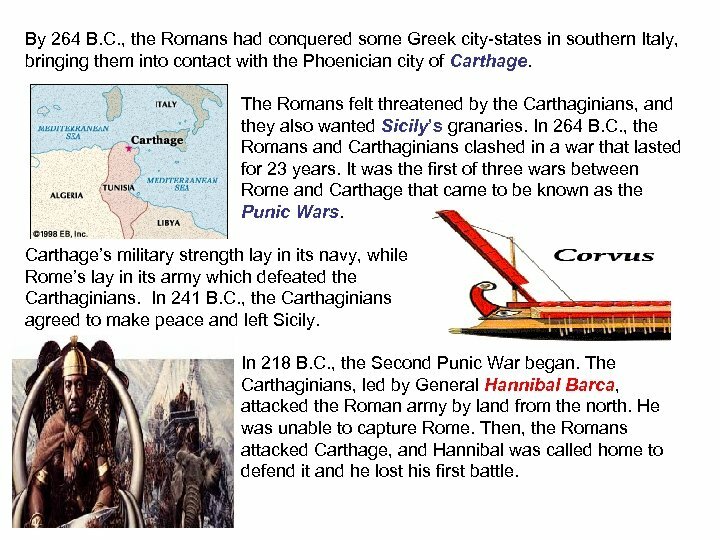 To prevent Carthage from gaining power, the Romans attacked in 149 B. C. , the Third Punic War. In 146 B. C. the Greek city-state of Corinth and some of its allies refused to obey a Roman order. The Romans attacked Corinth and burned it to the ground. Rome became the leading power of the Mediterranean world. 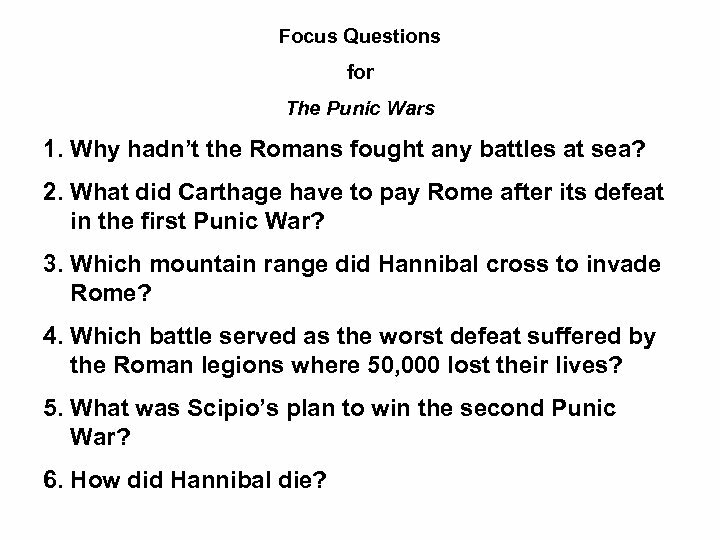 Focus Questions for The Punic Wars 1. Why hadn’t the Romans fought any battles at sea? 2. 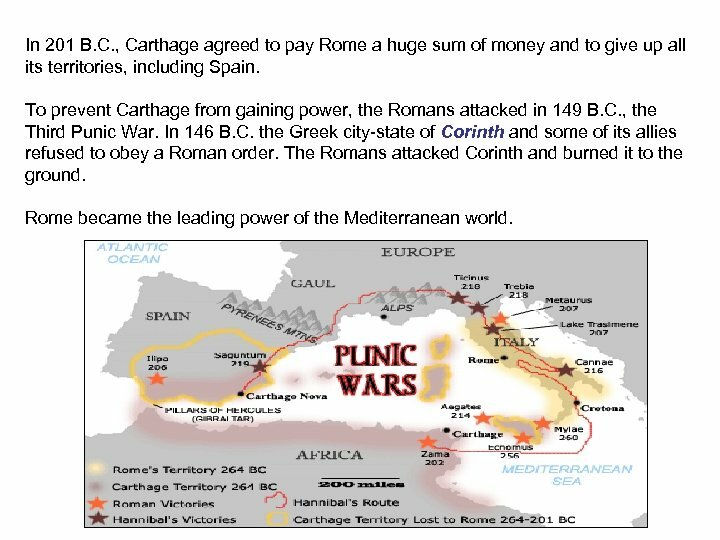 What did Carthage have to pay Rome after its defeat in the first Punic War? 3. Which mountain range did Hannibal cross to invade Rome? 4. Which battle served as the worst defeat suffered by the Roman legions where 50, 000 lost their lives? 5. What was Scipio’s plan to win the second Punic War? 6. How did Hannibal die? 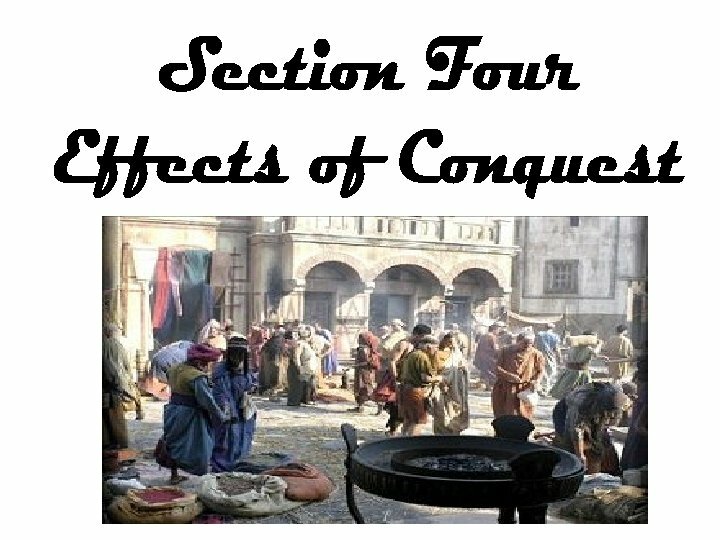 The conquests and the wealth changed Rome’s economy and government. Among the changes were 1. the replacement of small farms by large estates. 2. the coming of slavery. 3. a movement from farms to cities. 4. 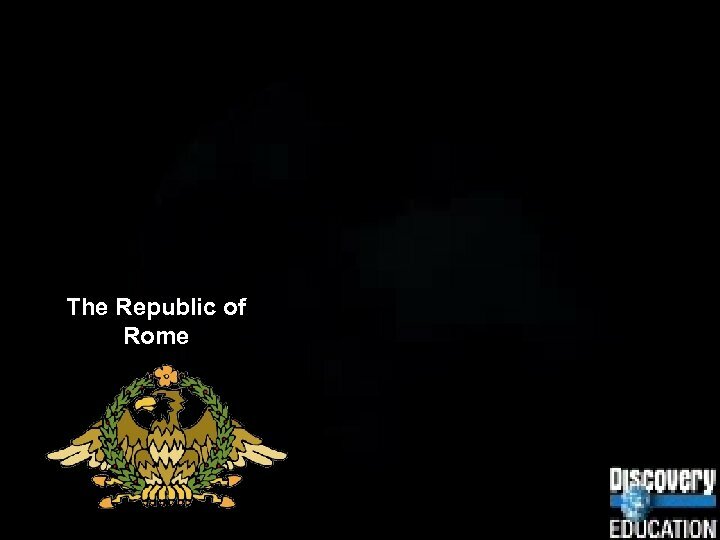 The decline of the Roman Republic. Rome’s conquests brought changes in agriculture. Large estates called latifundias replaced the small farms. Hannibal’s invasion was the main reason for this change. 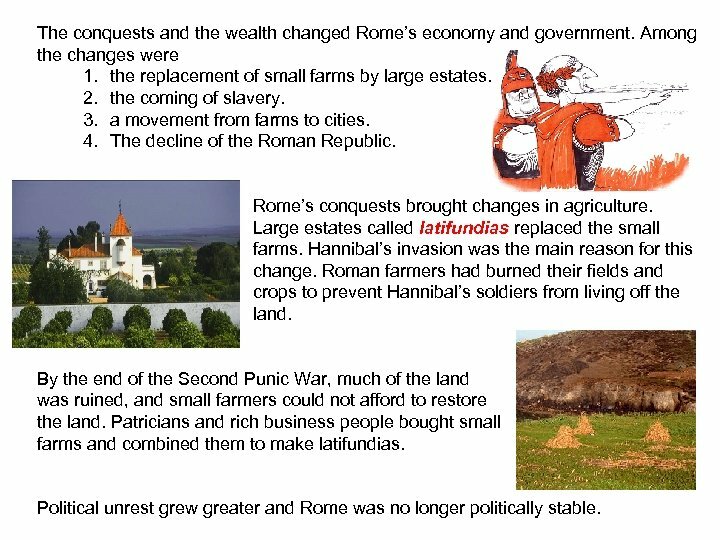 Roman farmers had burned their fields and crops to prevent Hannibal’s soldiers from living off the land. 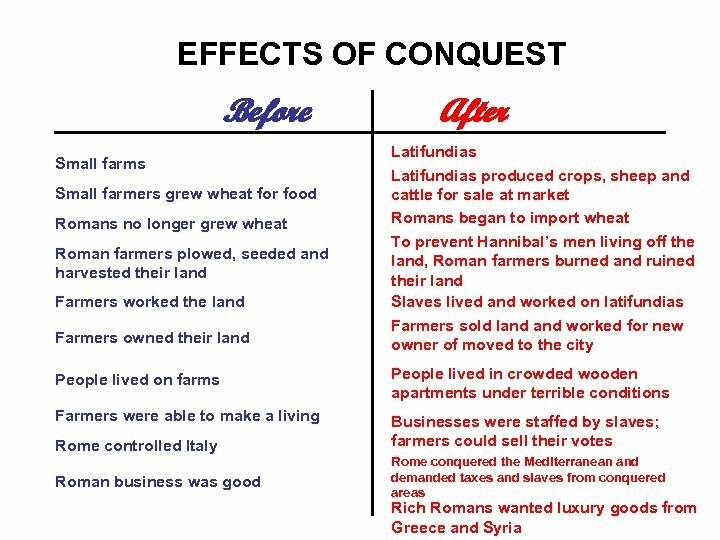 By the end of the Second Punic War, much of the land was ruined, and small farmers could not afford to restore the land. Patricians and rich business people bought small farms and combined them to make latifundias. 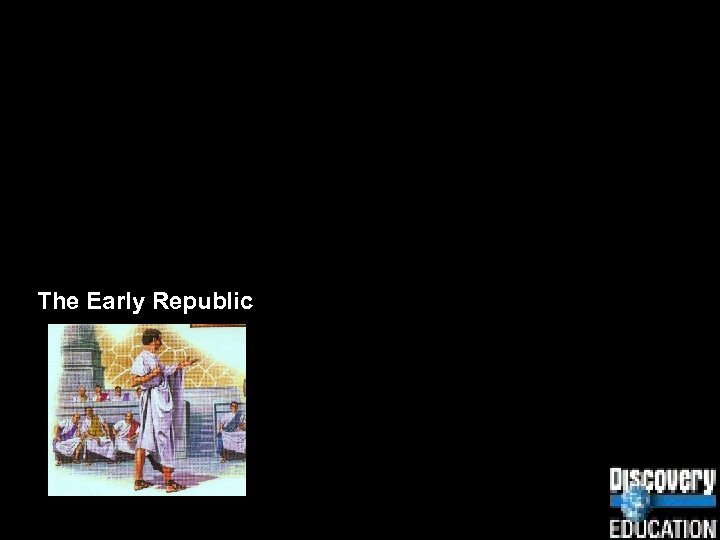 Political unrest grew greater and Rome was no longer politically stable. Another change in agriculture was in who worked the land. The Romans sent thousands of prisoners to Rome as enslaved people to live and work on latifundias. The farmers who had sold their land could stay and work for the new owner or move to the city. Almost all moved to Rome into crowded apartments with terrible living conditions. Most farmers could not get jobs and got money by selling their votes to politicians. As Rome’s rule spread beyond Italy, the Romans began to demand taxes and enslaved people. Tax contracts were sold to people called publicans who collected taxes from the conquered people. By about 135 B. C. , Rome was in a great deal of trouble. 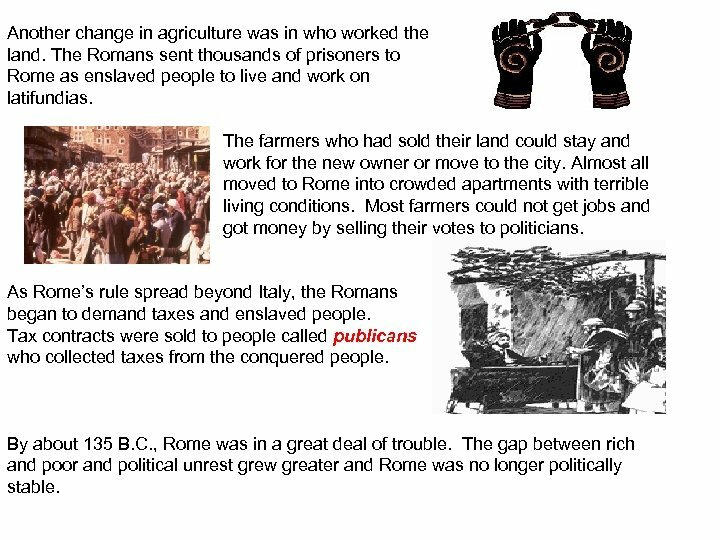 The gap between rich and poor and political unrest grew greater and Rome was no longer politically stable. 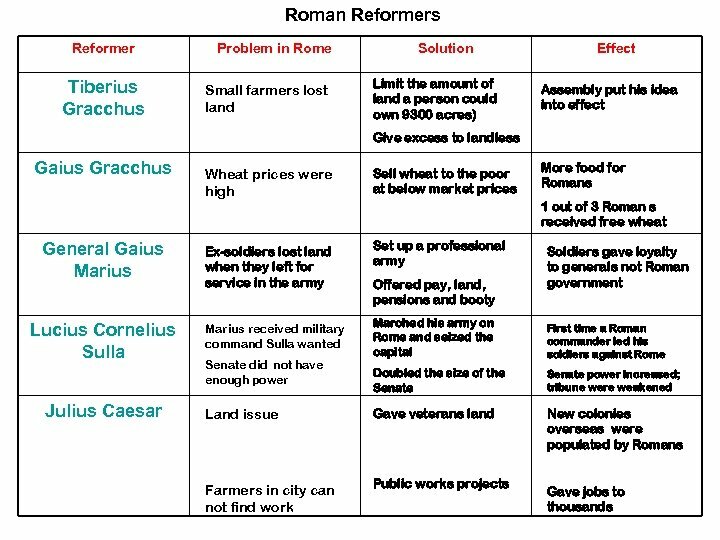 Over the next 100 years, many different popular leaders–reformers and generals– tried to improve conditions in Rome. 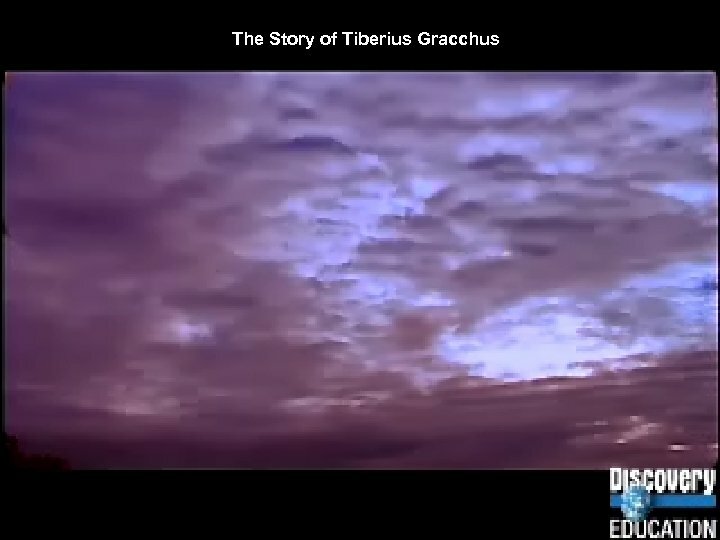 Tiberius Gracchus became a tribune in 133 B. C. and was the first reformer. He wanted to limit the amount of land a person could own. He was killed in a riot staged by the Senate when he ran for a second term as tribune. In 123 B. C. , Tiberius Gracchus’s younger brother, Gaius Gracchus, was elected tribune. 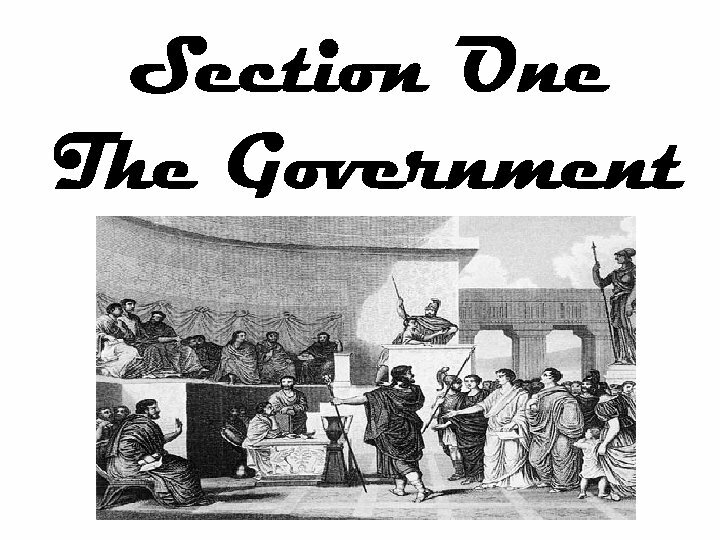 When the Senate began to feel threatened by his ideas in 121 B. C. they had him killed. In 107 B. C. , General Gaius Marius, a military hero, became consul. Marius thought he could end Rome’s troubles by setting up a professional army, open to everyone. Another general, Lucius Cornelius Sulla, was given a military command that Marius wanted. 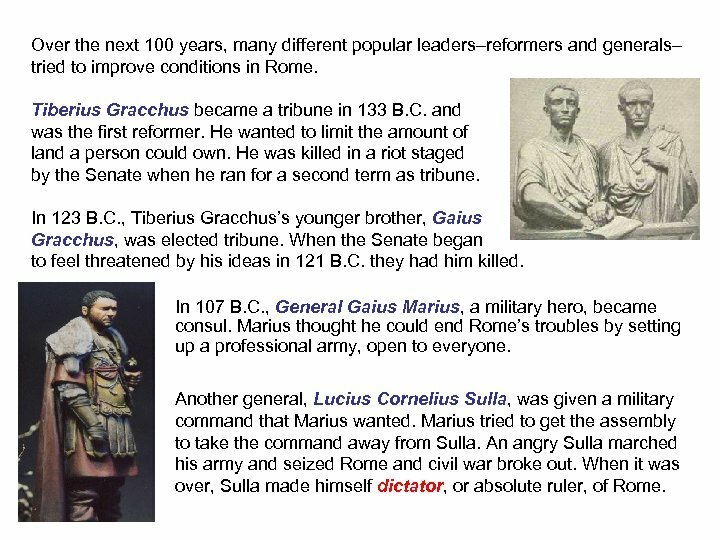 Marius tried to get the assembly to take the command away from Sulla. An angry Sulla marched his army and seized Rome and civil war broke out. When it was over, Sulla made himself dictator, or absolute ruler, of Rome. When Sulla retired, a new group of generals fought for control of Rome. 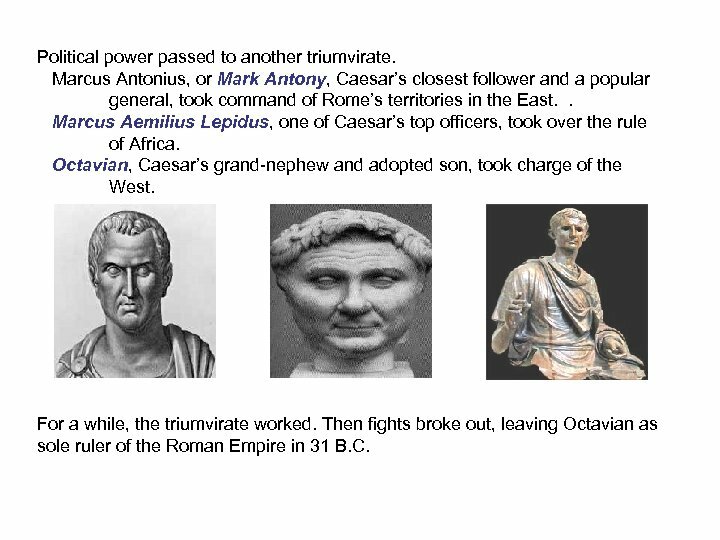 In 60 B. C. , political power passed to a triumvirate, or a group of three persons with equal power. 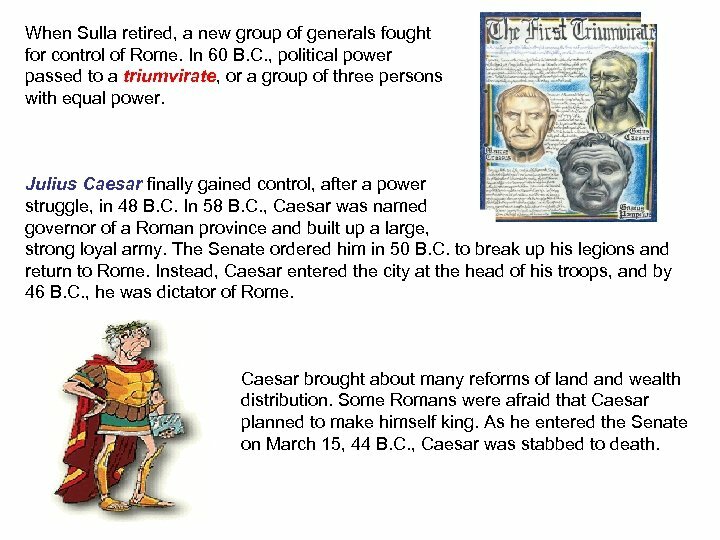 Julius Caesar finally gained control, after a power struggle, in 48 B. C. In 58 B. C. , Caesar was named governor of a Roman province and built up a large, strong loyal army. The Senate ordered him in 50 B. C. to break up his legions and return to Rome. Instead, Caesar entered the city at the head of his troops, and by 46 B. C. , he was dictator of Rome. Caesar brought about many reforms of land wealth distribution. Some Romans were afraid that Caesar planned to make himself king. 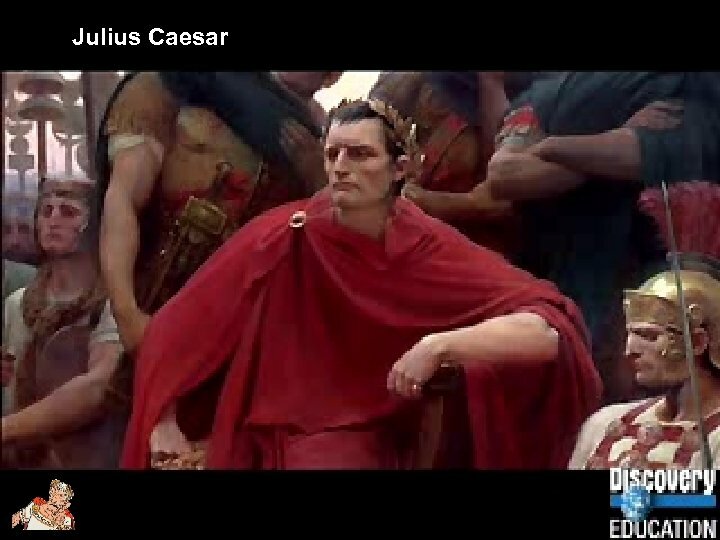 As he entered the Senate on March 15, 44 B. C. , Caesar was stabbed to death. Political power passed to another triumvirate. 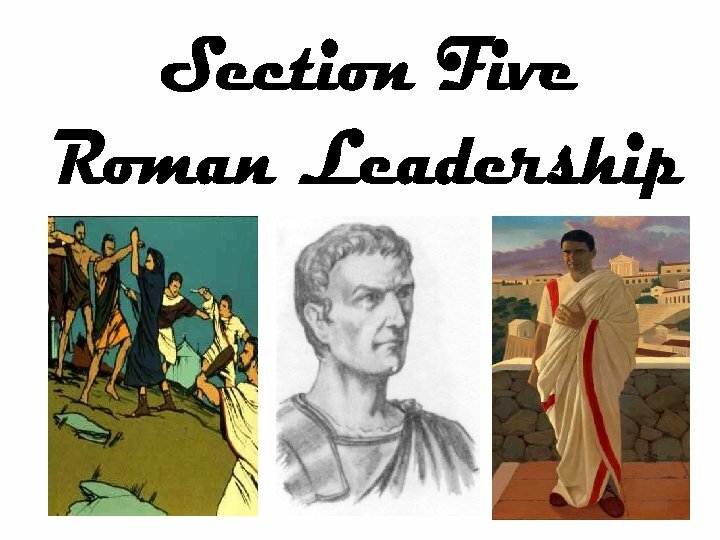 Marcus Antonius, or Mark Antony, Caesar’s closest follower and a popular general, took command of Rome’s territories in the East. . Marcus Aemilius Lepidus, one of Caesar’s top officers, took over the rule of Africa. Octavian, Caesar’s grand-nephew and adopted son, took charge of the West. For a while, the triumvirate worked. Then fights broke out, leaving Octavian as sole ruler of the Roman Empire in 31 B. C.